Comic-Con International 2018 is happening in San Diego this week. If you are going to be there, I wish you a exciting, fun and safe convention. If you’re a Black Lightning fan, be on the lookout for some special convention exclusives. There’s a special Black Lightning bag that comes with a Black Lightning pin. They look great. There’s also an exclusive San Diego Comic-Con Lego Black Lightning figure that’s amazing. Writing the award-deserving Black Lightning: Cold Dead Hands series that reinvented my creation for today was incredible satisfying. Seeing Black Lightning in a hit TV series on the CW was literally a dream come true. But a Black Lightning Lego figure? Now I know I’ve made it! Sadly, I will not be at the convention. However, I encourage you to tell everyone I was there, that I was the nicest comics creator you met at the convention and that, after meeting me, you couldn’t stop fantasizing about me. Because all of those things would be true if I was at Comic-Con. I raise my glass to all those lucky enough to be in Sam Diego this week. Have a wonderful time! Writer Sholly Fisch is the E. Nelson Bridwell of today. Coming from me, that’s high praise. Because when Bridwell wrote Super Friends in the 1970s, I thought it was a better Justice League comic book than the actual Justice League title. His stories were clever with fun twists and he made use of the vast cornucopia of characters to be found in the DC Universe. Fisch’s Scooby-Doo! Team-Up Volume 5 [DC; $12.99] is every bit as delightful as Super Friends was. This trade paperback collects the stories from issues #25-30 of the ongoing title. The stories were all published online in a half-page format, but the art and layouts are so skillfully done that doesn’t leap out at the reader. What Fisch brings to these stories is an encyclopedia knowledge of the DC Universe and a wry humor that works on multiple levels. The younger readers will be entertained and the older readers will find additional laughs aimed at them. For example, an issue teaming the Scooby gang with Green Arrow and Green Lantern during the emerald heroes hard-traveling days makes light of “moral decay” and other very familiar lines from the Denny O’Neil/Neal Adams comics of the 1970s. I chuckled out loud several times. Besides the “green team,” the six issues feature Hong Kong Phooey, Plastic Man, Jonah Hex, Top Cat and the Challengers of the Unknown. I’m not listing all of the other heroes and villains who appear in these tales because I don’t want to lessen the surprises that await you. I will say this Hong Kong Phooey team-up was more humorous and satisfying than the martial arts mutt’s recent meeting with Black Lightning. This appearance made me want to watch the original Hong Kong Phooey cartoons. I shouldn’t gloss over how well Fisch writes the Scooby-Doo cast. He nails all of them: Scooby-Doo, Shaggy, Velma, Fred and Daphne. The mysteries they solve, even with the inclusion of super-villains and such, are true to the classic cartoon mysteries. Factor in the terrific art of Dario Brizuela, Scott Jeralds and Dave Alvarez with their clean lines and solid storytelling and you have a fun comic book for all ages. Scooby-Doo! 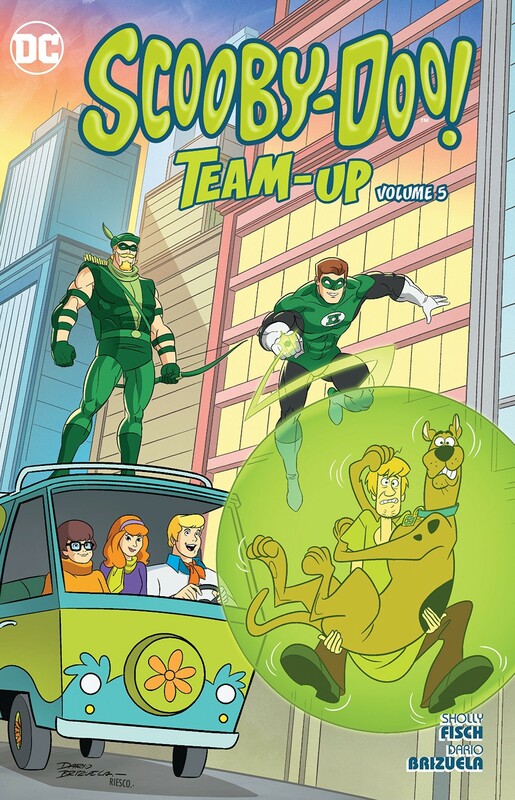 Team-Up Volume 5 is my pick of the week. I recommend it to all of my Tips readers, especially those looking for something a bit more lighthearted than most super-hero comics. 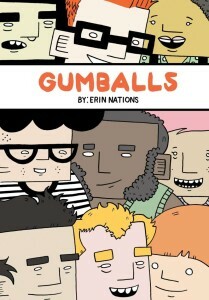 Gumballs by Erin Nations [Top Shelf; $19.99] is a collection of his comics works that range from single-page strips to longer stories. These fascinating and funny works deal with the cartoonist’s gender transition, his life as a triplet, his workplace and more. There’s a series of vignettes about a love struck teenager and a series of full-page “personal ads” by some odd characters seeking love in one form or another. I found the latter baffling, but riveting. Sometime in the hopefully near future, I’ll be able to write about a book like this without mentioning diversity or gender identity. Sometime, these stories will just be observations on and stories of a comics creator’s life. Yet, because we live in a time enjoying a glorious outpouring of diversity, a time enriched by all these new voices, I feel this needs to be mentioned. And because we also live in a time when throwbacks to primitive times strive to eliminate our wondrous diversity, I feel it’s important for creators and fans to champion this excellent material. Gumballs collects the first four issues of the Gumballs comic book and adds 32 pages of new material. I thoroughly enjoyed this book and recommend it to teen and older readers. Check it out. I have a very mild obsession about watching every movie based on a comic book or comic strip. It’s mild because no one has been good (or bad) enough to inflame my minor passion by publishing an easy-to-use encyclopedia of such movies. If someone does that, I could be in trouble. Accident Man was a comics series by Pat Mills and Tony Skinner that appeared in the 1990s comics magazine Toxic! The title character was an assassin who made his for-hire murders look like accidents. I read a handful of Accident Man stories back in the day, but have no clear recollection of them. Mike Fallon is a stone cold killer whose methodical hits baffle the police and delight his clients. He’s the best at what he does. But when a loved one is dragged into the London underworld and murdered by his own crew, Fallon is forced to rip apart the life he knew in order to hold those accountable and avenge the one person who actually meant something to him. Accident Man was fun, but both Adkins and the movie came off like “Jason Statham Lite.” It dragged every now and then during its 105-minute running time, but the various killers were darkly amusing. The story set its sights on its resolution and there were no real surprises between the start of Fallon’s personal mission and that resolution. The conclusion was just there; I didn’t find it truly satisfying. It needed something more. Regular readers of my work know that I am far more forgiving of TV shows and movies than of comic books. I know how to create great comic books. Movies and TV are not presently part of my skill set. So my suggestion to you is that if you really like Jason Statham movies and have watched them all, Accident Man might tide you over until the next one.